Community is now offering their R.5 weather-resistant loudspeakers in both standard black and white finishes. 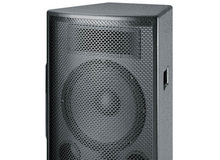 EAW completes its KF line of speakers with the 3-way KF200NT model. Carvin's new PM15 2-way speaker features a 15" LF driver and a titanium horn driver, and can run at up to 1600W peak, according to the company. Now available in the U.S., HK Audio offers its Elements modular sound reinforcement. Phonic Corporation will be demonstrating its new iSK speaker series at the 2011 Winter NAMM show. RCF has introduced the TT22 WP weatherproof high output two-way passive speaker. For a limited time, Peavey Electronics is offering a rebate to U.S. customers who purchase selected PV Series Enclosures between October 1 and November 30, 2010. Alcons Audio’s Architect Colour Option (ACO) is designed to have Alcons' models to be ordered in 180 different RAL colours, the standard European architectural colour matching system. Electro-Voice is launching additions to its EV-Innovation family of installation-dedicated loudspeakers at InfoComm 2010.